Our project is now on Kickstater. You are here: Home / LA-MULANA BLOG / Our project is now on Kickstater. 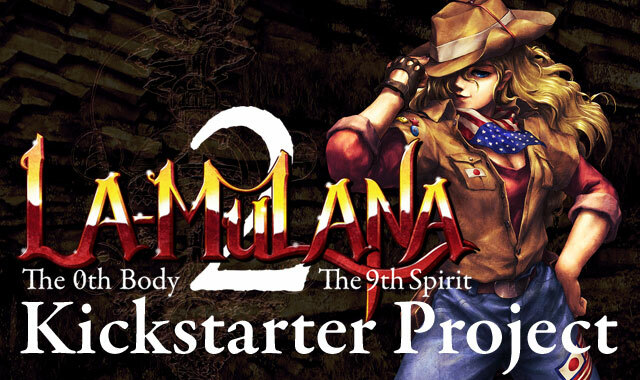 Today, we launched a Kickstarter project of producing LA-MULANA2. We turned the plan into action in this summer, but it was not going to be easy as I thought. I wish we could start the project just after TOKYO GAME SHOW. However, we were sure we wouldn’t be ready in that time, so we would take some time after TOKYO GAME SHOW. In the end, we have been in a trouble even since we completed the preparation. To the people who shared this secret of Kickstarter project with us, to the people and companies who supported us and to everyone who is waiting an update of LA-MULANA2 after TGS, we got you into a fuss for that reason. I’m sorry. But our project has finally started. Let’s enjoy it in a festive mood for a month than being afraid of failure. looking toward psn-version ^_^ , the EX version for PSVita is very good. many thanks for your work, best experience since SotN. I’ll throw my hat in a well, let’s see if we can get the pseudo MSX version remade as well! Got it after watching DC and have still have the program and patch saved somewhere. I will tell the development team your idea. Thank you for making La-Mulana (and now La-Mulana 2)! Can I ask you something though? How about adding some of the unused/prototype music to La-Mulana 2 as a secret? I know they feature elements that are similiar to the music used in La-Mulana, but I think it would be a nice reference to the original game and since Lemeza’s daughter is the main hero, some familiarity might work out really well. I think Wonder of the Wonder -prototype-, Aqua Wish and Electric Prophet are really good tracks that might fit really well. Of course I won’t be sad if you think this is a bad idea. It’s your game and I trust you will do a great job! Will this be ported to Mac or the WiiU / Wii U? Thank you! Well, I speak as I have just finished the remake. Meaning I’ve now finished both versions of La-Mulana, the original and the remake. So…yeah. You bet your arse I’m helping fund a sequel. Best of luck on the kickstarter guys! La-Mulana 2 sounds like it’s gonna be even more epic than the first game!